A New Edition of the *Out-Geek* Your Friends Party Game! 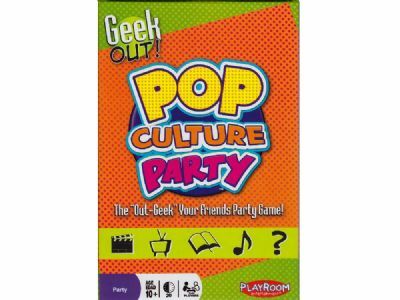 The award-winning geek trivia party game has taken on a new twist in this brand-new Geek Out!™ Pop-Culture Party Edition! Level the playing field with topics the whole family geeks out over: Pop-Culture! Whether you*re an expert in TV, Movies, Music, Literature and more, you*ll have a blast finding out once and for all which player or team knows most about your favorite pop-culture topics. You don*t have to be a pop culture expert (but it helps!) to win this fun social interaction and bluffing game of pop-culture geek lists!